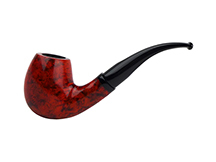 Milan Tobacconists offers a wide selection of fine pipes, such as the Erik Nording pipes shown below, for the discerning smoker at reasonable prices. If you are unable to easily locate a particular tobacco pipe, please give us a call at 877.70MILAN or send an email to customercare@milantobacco.com. We'll do our best to make a match! Erik Nording is Denmark's number one pipe master and one of the world's premier pipe carvers. He is one of the Danish pioneers to introduce what is called the Danish Freehand style. Nording's sweeping, natural lines and finishes contrast with the rigidly uniform, man-made look of conventional pipes. Even his own conventional briar pipes are uniquely Nording, with little touches that set them apart from all others. Over his 50 years as a master craftsman, several of Denmarks other pipe masters have served as his apprentices. Considered one of the best values in pipes, try a Nording for yourself and experience the pleasure of smoking one of the finest and most affordable Danish pipes. Click on any link or image below to view all of the available pipe shapes in each of the Nording lines.